Skipped the morning workout today given we had planned a hike in the nearby Eldorado State Park. There are so many amazing outdoor options to choose from in the greater Denver area we were almost paralyzed with choices but when the forecast predicted 95 degree temps we opted for the state park with a natural spring pool nearby. We have a mixed group of fitness levels so opted for an easy hike. Post-hike we cooled off with a quick swim before heading back (via Nordstrom’s Anniversary Sale at the Flatiron Crossing store). Here I am before I got too hot and sweaty in my Caslon 9in inseam clean front chinos and an Athleta Tinsley tee (yes, when they went on sale I bought them in multiple colors but as much as I am currently obsessed with Athleta is really is criminal to have ever expected anyone to pay $44 for the shirt; however at $15 it’s a figure flattering, go to active tee when you don’t want to look like you have specifically put on gym clothes). The Saucony Peregrine trail runners I grabbed on Zappos just days before the trip served their desired purpose well. My feet were comfy, no blisters. The treads held the terrain well, even on steeper declines. After a long day of hiking, even with cooling off at the time warp Eldorado Springs Resort Public Pool, no one was really in the mood for a meal requiring an intense amount of effort. So we aimed for casual and, having had our share of outstanding new American farm to table the last couple of days, we opted for ethnic and chose a cuisine (Malaysian) that none of us had ever had before. The meal was meh but it was fun to try something new. The Fitbit logged 23,792 steps today. About 4.5 of the ~9mi was attained during the hike. 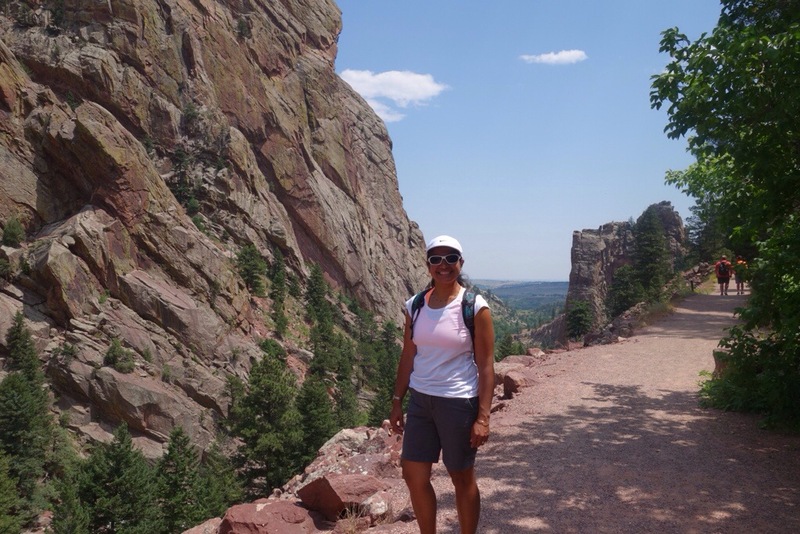 This entry was posted in Fashion, Fitness and tagged Athleta, colorado, day hike, Eldorado Canyon, girls' weekend, hike, hiking, Saucony, Saucony Peregrine by surgeoninheels. Bookmark the permalink.